The What: Epson has introduced the PowerLite L-Series for corporate, education, and houses of worship. The new Epson PowerLite L615U, L610U, L510U, L400U, L610W, L500W, and L610 are designed to provide high value to customers, featuring an integrated laser light source, up to 6,000 lumens of color and white brightness, resolution up to WUXGA, and enhanced wireless technology to connect to multiple devices. 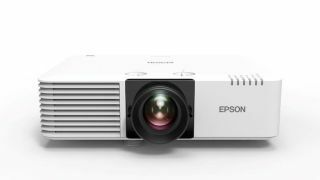 The What Else: The new PowerLite laser projectors leverage Epson’s 3LCD technology to deliver up to three times higher color brightness than competitive 1-chip DLP projector models, according to the company, and include features to improve the ease of installation and setup. Epson’s laser technology features full 360-degree installation and projection at any angle, and Epson’s lens shift feature provides additional versatility for both new installations and for upgrading existing lamp projectors. The new PowerLite L-Series also supports advanced wired and wireless solutions, including HDMI and HDBaseT. To support BYOD classrooms, the projectors provide enhanced wireless display technology, allowing teachers to connect the projector to up to 50 Chromebooks, PCs, and Mac computers, and iOS and Android devices. Educators can also simultaneously display up to four screens with the Epson iProjection wireless display solution. The high-end PowerLite L610U and L615U models offer wireless screen mirroring from a smartphone or streaming device with Miracast. The Bottom Line: The new PowerLite L-Series aim to provide strong value for laser projection within the 4,500–6,000-lumen range, and are well suited for corporate spaces, educational institutions, and houses of worship with high ambient lighting. The new series offers virtually maintenance-free operation with up to 20,000 hours of laser light source. Weighing between 17 and 19 pounds, PowerLite L-Series features a compact and versatile form factor for convenient portability or installation, and models equipped with wireless enterprise level security.